Assistant professor, Structural Geology, Science Department, Basilicata University, Italy. Ph.D. in Structural Geology and Geomechanics, Stanford University, California, USA (2001-2006). M.S. in Geology, Saint Louis University, Missouri, USA (1998-2000). B.A. in Geology, University of Catania, Italy (1990-1997). June 2007/ September 2010 – Researcher, Camerino University, Italy. 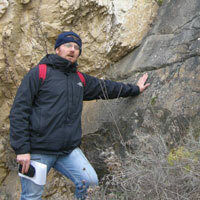 December 2006/March 2012 – Co-director of the Faults and Fractures in Carbonates project, Camerino University, Italy. May 2006/July 2006 and April 2009/July 2009 – Consulting Geologist, Geomechanical studies, Saipem and Italfer companies, Italy. June2003/September 2003 - Summer Internship, Anadarko Oil Company, USA. September 1997/June 1998 - Consulting Geologist, Geocheck consulting, Italy. From October 2010 - Mechanical stratigraphy of Apulian and Apenninic carbonates, Faulting processes in porous and tight limestones , Fault and fracture permeability, Structural setting of southern Apennines. Basilicata University, Italy. September 2006/September 2010 – Deformation mechanisms associated to fault nucleation and development in carbonates of central and southern Italy. Camerino University, Italy. September 2001/April 2006 – Inner structure and chemical-physical properties of the normal faults bordering the eastern side of the Fucino Basin, central Italy (Ph.D. thesis). Stanford University, California, USA. February 2001/April 2001 – Structural setting of the Ajon area, Greece. Catania University, Italy. September 1998/January 2001 – Stable isotope composition of carbonate fault rocks (M.S. thesis). Saint Louis University, Missouri, USA. September 1998/March 1999 – Construction of a laboratory for stable isotope analysis. Saint Louis University, Missouri, USA. July 1998/August 1998 – Micromechanics of carbonate fault rocks. Catania University, Italy.